NEW FOR 2017!! 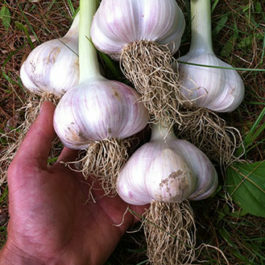 Margiana Rockney-Peterson selected this GARLIC MIX at Rosasharn Farm in Rehoboth, MA. 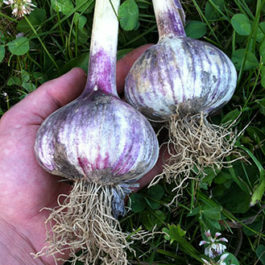 Starting with a number of PORCELAIN & ROCOMBOLE varieties of garlic, Margiana inter-planted cloves from only the biggest, best heads for many years. The original variety names used to create Rosasharn are now forgotten, as performance and flavor are what Margiana cares about. But for the home gardener, Rosasharn gives a great opportunity to sample a range of tastes and types without having to agonize over choices. 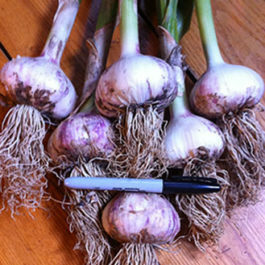 While not a “true variety” as garlic varieties are commonly thought of, Rosasharn constitutes what I would call a true Grex. Enjoy! FOOL-Grown, and Tested for nematode & disease for multiple years.